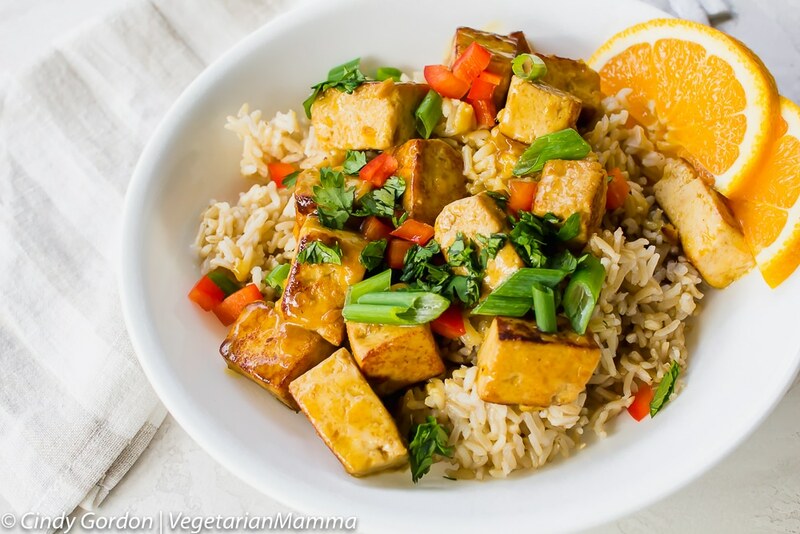 Orange Tofu is a delicious and easy tofu recipe that your entire family will love! The crispy tofu bites are flavored with an orange sauce and served over rice. Thank you to EZ Tofu Press for sponsoring this post. Sometimes you just crave a delicious tofu bowl. It is pretty hard to eat out sometimes, when you are dealing with vegetarian, gluten-free and food allergy restrictions. For us, it is easier (and cheaper) to make our food at home. While we do eat out sometimes, we mostly eat at home. Being able to know exactly what is in our dishe is important! Orange is such a powerful flavor. I admit, it might not be for everyone. 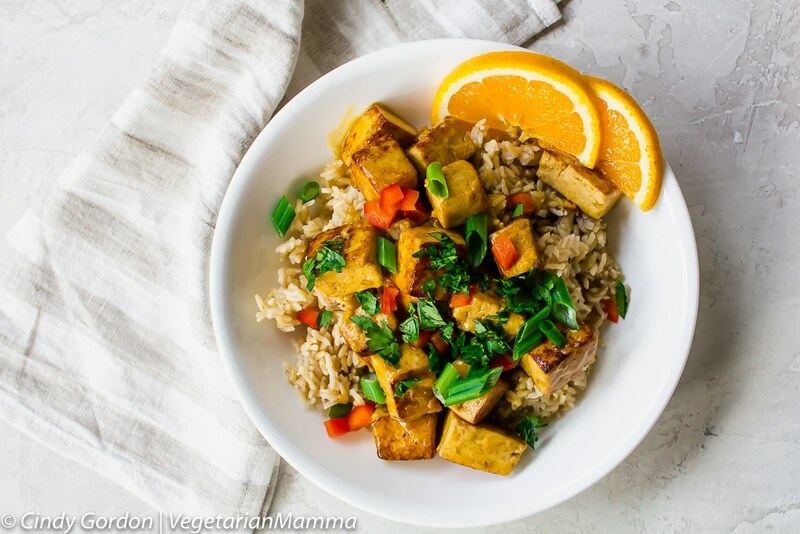 For this vegetarian tofu recipe, I used fresh oranges to get my orange juice. You can use a hand juicer (affiliate ad link) or an electric juicer (affiliate ad link) to get the job done. Pressing your tofu is important. Did you know that pressing your tofu is important? I did not, at first! Pressing the tofu helps to remove extra liquid. It allows the tofu to cook up better! Wondering how you press tofu? Well you use a special gadget! The EZ Tofu Press (Amazon affiliate link) takes the liquid out of your firm or extra firm tofu easily, quickly, and with less mess than using plates and cans. This press utilizes simple mechanics and quality materials to ensure that it’s long-lasting and easy to use. The plastic is BPA free and the grommets and screws are stainless steel. You can wash the EZ tofu Press by hand or in the dishwasher. We love tofu for many reasons but a big one is that it is a complete protein. Unlike some vegan and vegetarian protein sources, such as nuts and beans, soy is a complete protein, which means that it contains all of the amino acids that you body cannot create on its own. Fish, meat and dairy products are also complete protein sources, but if you don’t eat those things, tofu is an excellent choice to make sure your body is getting those amino acids. Not really, the sauce isn’t secret but it is delicious. Be sure to marinate the tofu to help the tofu soak up the delicious flavor! Does this orange tofu recipe reheat well? Yes, it does! Because it reheats so well, it makes it a great recipe for meal prepping! 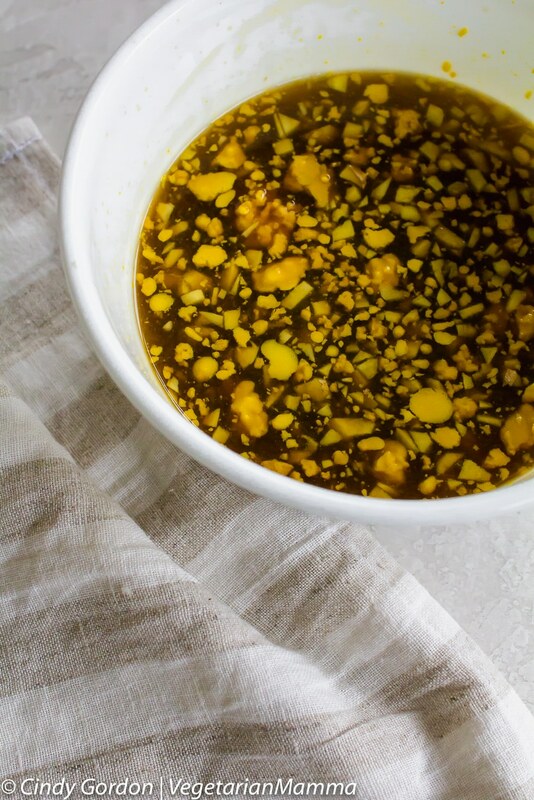 Prep a double batch, divide into containers and have it for lunch all week long! Your belly will thank you! Can I use soy sauce? In this recipe I used a coconut amino instead of soy sauce. I have been trying to switch over to coconut aminos to take advantage of their benefits. You can most certainly use soy sauce. If you are gluten-free be sure to use a GF soy sauce! What type of rice should I use? You can use any type of rice that you wish. You can use white rice, brown rice, jasime rice or basmati rice! The rice options are endless! This reminds me of Panda Express Orange Chicken! 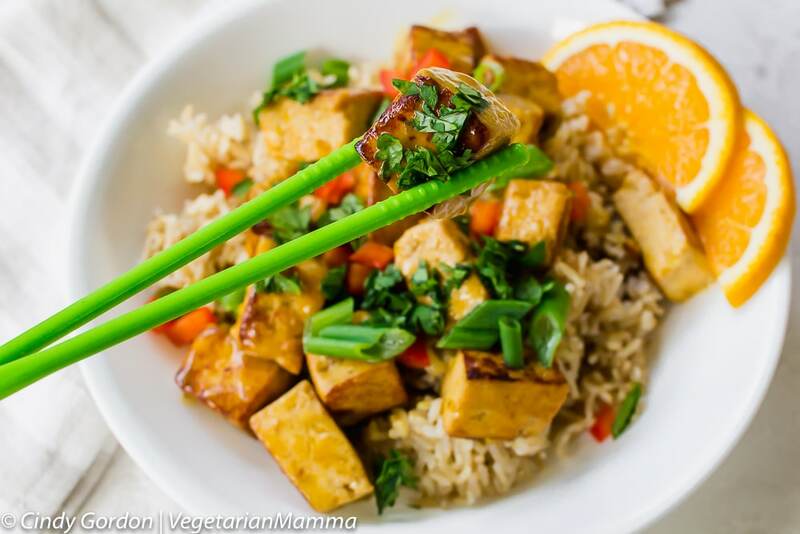 I’ve gotten some feedback that this vegetarian recipe is a close match to the Orange Chicken that is served at Panda Express! Give it a try and let me know what you think! 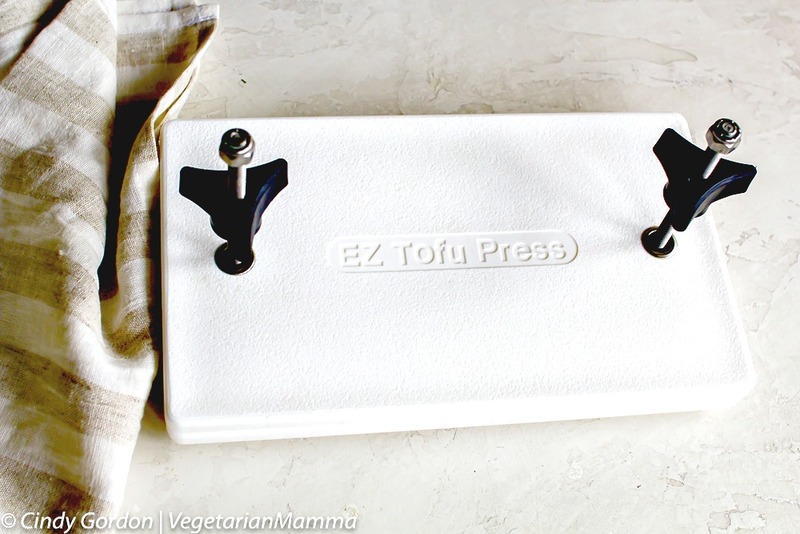 Start by pressing your tofu for at least 10 minutes using the EZ Tofu Press. Then dice your tofu into bite sized pieces and set aside. 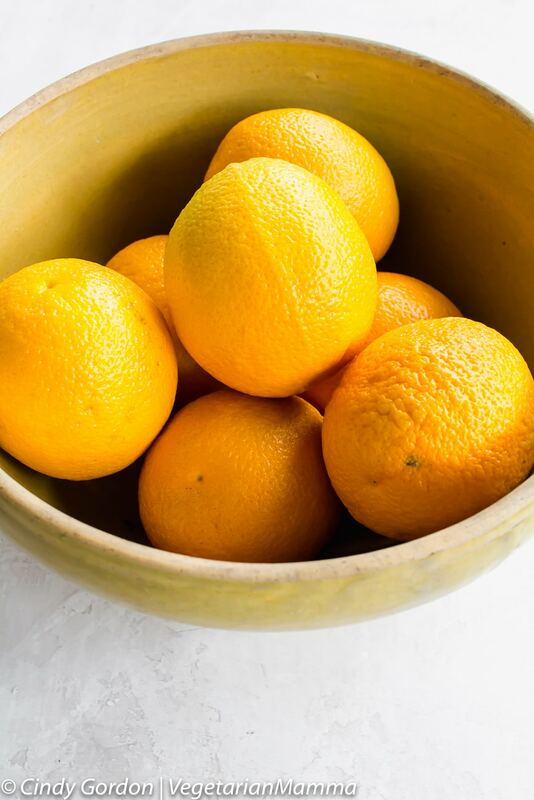 Combine fresh orange juice, orange zest, coconut aminos and ginger. Stir to combine. Put tofu bites and orange juice mixture into a bag. Marinate for 30 minutes. Heat 1-2 T of oil in a pan over medium heat. 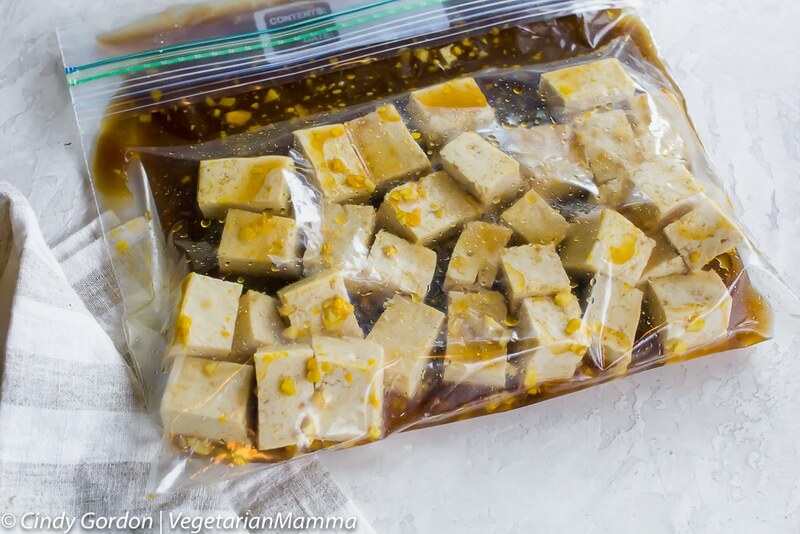 Remove tofu from marinade. Fry tofu for 2 minutes, add in diced bell pepper. Saute until tofu is golden brown. Meanwhile, bring the marinade to a boil and add in cornstarch. Stir to thicken. Once liquid begins to thicken remove from heat. Add orange sauce to the tofu pan. Stir to coat. Divide rice among 4 plates. Top with orange tofu and bell peppers. Garnish with green onions or sesame seeds. Question: Have you tried orange tofu or orange chicken before? 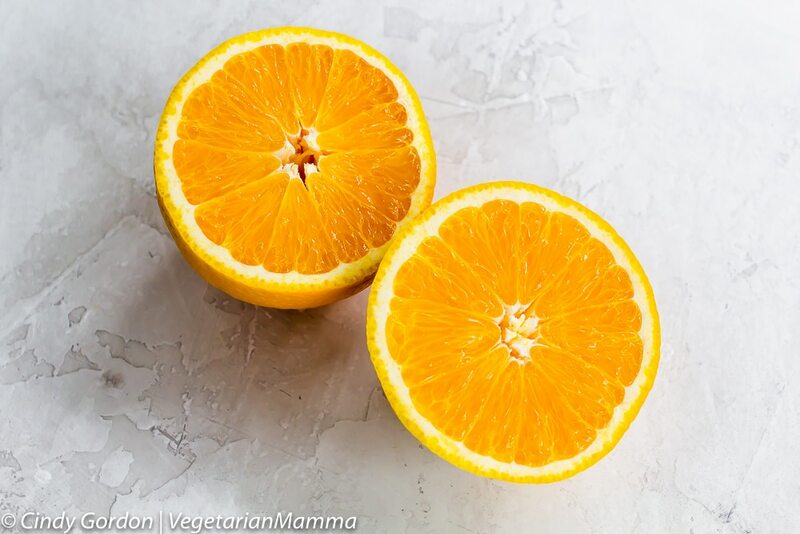 Are you a fan of the orange flavors? This looks delicious! My favorite tofu recipe is tofu palak paneer. So healthy and delicious. 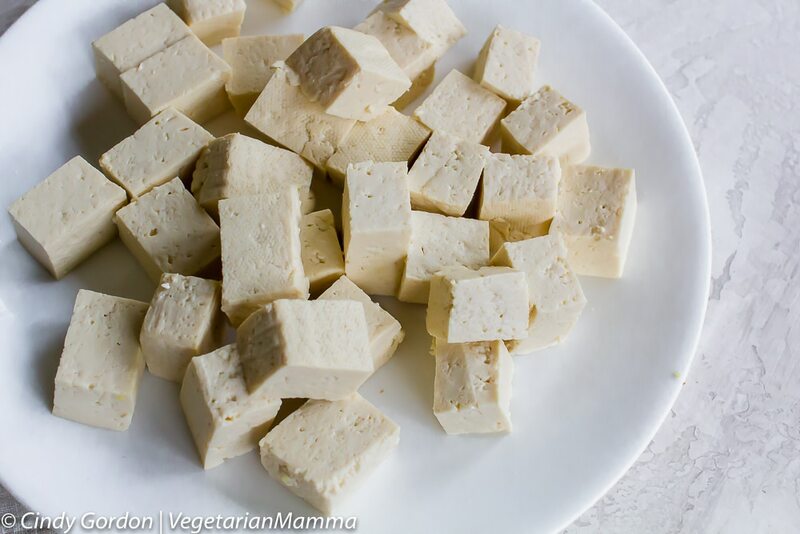 Have you tried freezing the blocks of tofu before presssing? It somehow gives the tofu a firmer texture that I love. I have not tried to freeze them. I will though, thank you for the tip! Are you letting it thaw completely before you cook? I’d love a firmer texture! Yes I freeze it then thaw completely, drain and press, then cut it up and cook it however the recipe calls. Yes, I let it defrost then drain, press, and prepare as normal. Can’t wait to see what you think! I love the fresh orange flavors in this dish. Great option for a meatless meal that is totally satisfying! Perfect for a meatless dish! 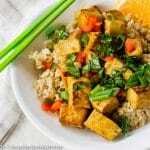 I’ve really been enjoying tofu lately so this recipe is timely and perfect! I know my family will love this dish…so flavorful and delicious. I love that tofu gadget! I have pressed tofu before with plates and a heavy mallet and it was a hassle!! Love all the flavors in this too! This will work better than the plates, I promise! 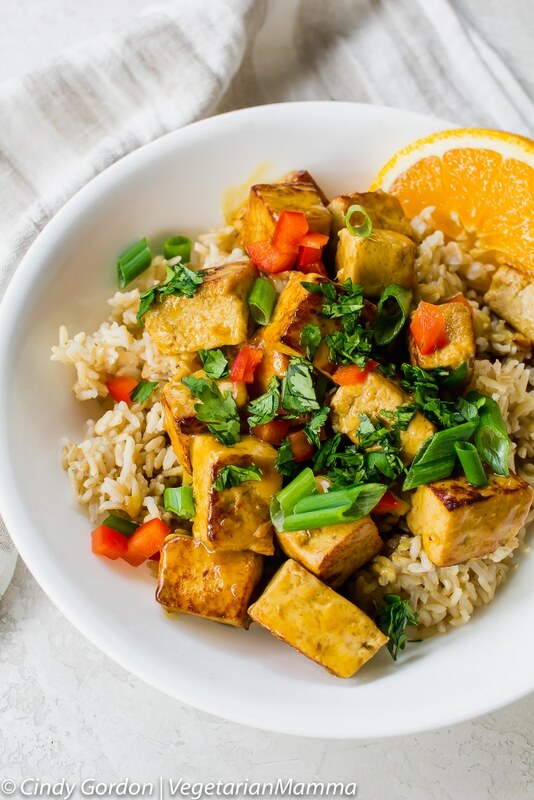 This tofu dish looks so delicious! And I think I need that tofu press … we eat tofu quite often at home and I never knew there was an implement to help get the excess water out! Its a time saver for sure! Definitely bookmarking this for a delicious and healthy weeknight meal soon. 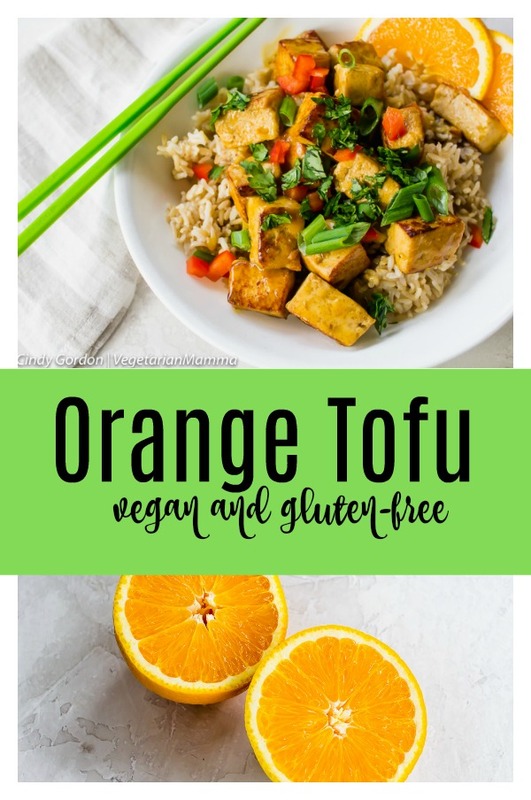 I LOVE the orange flavors and think this could even get my husband to eat tofu! The orange is amazing for sure! I love my EZ tofu press — have had it for years. This recipe sounds terrific!